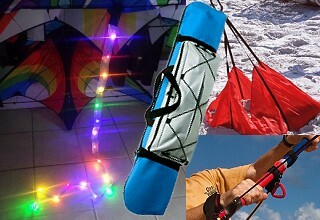 We have lots of accessories which compliment many of the kites we carry. Dual Line Straps, Quad Line Handles, LED lights and more! See the selection below. 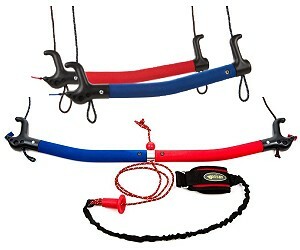 Prism Convertible Control Bar with safety leash. 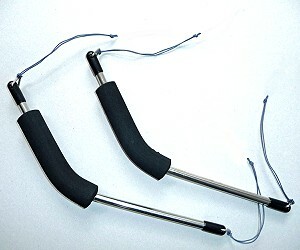 Comfort grip Control Bar can be used 2-Line or 4-Line and easily converts to a pair of Quad Line Handles by replacing the central bar connector with handle end caps. Suitable for fixed-power 4-Line kites in Bar or Handles mode. Pair of foam filled Nylon webbing flight straps with heavy cord loop for line attachment. Assorted colors. Sturdy 21" Control Bar with comfort grip, line storage horns and leaders. 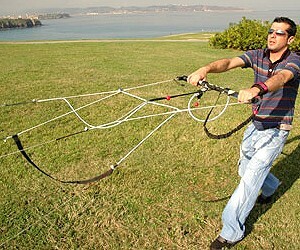 Suitable for small to medium size 2 line ram-air power kites. Instructions included. 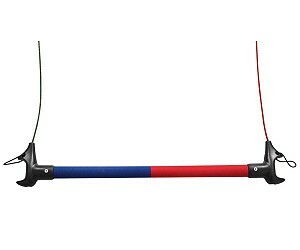 15" metal Quad-Line Handles by HQ with molded color-coded foam grips. Color-coded leader lines. 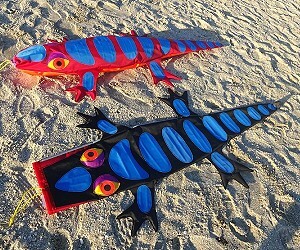 Available with or without "Kite Killers". Suitable for all power-on Quad-Line kites. Stainless Steel 13" Quad Line Handles. Comfort grip, genuine Revolution replacement standard handle set. RadSails Pro 50cm Quad-Line Control Bar with Crossover system for improved turning capability for all "power-on" fixed-power Quad-Line Ram-Air kites. Complete with hook-up instructions, harness loop, re-launch grab, safety leash and Carry-case. 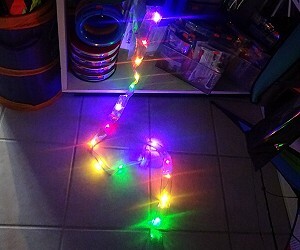 6ft long illuminated Kite Tail with 17 super bright LEDs. 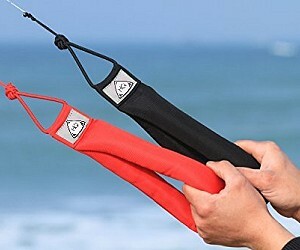 Lightweight, easily clips to kite, line or telescopic pole. Lights operated with on/off switch in battery pouch. Replaceable CR2032 battery lasts approximately 30 hours. 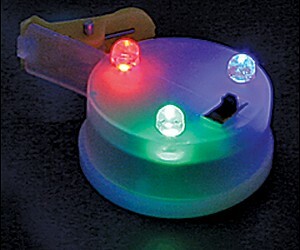 3 super bright multi-color flashing LEDs, only 3/4 oz. 1.5" diameter. 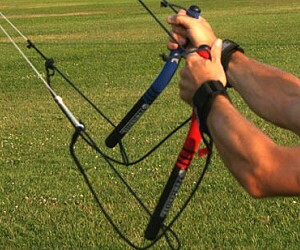 Clip onto fabric thin spars or, best of all, flying line. Replaceable CR1632 batteries. Made of polyester pack cloth with adjustable shoulder straps, zippered stunt kite line sleeves, 24" x 9" expandable line pockets, full-length zippers and cinch cords to carry the really big stuff on the outside. Both sizes 12" wide. 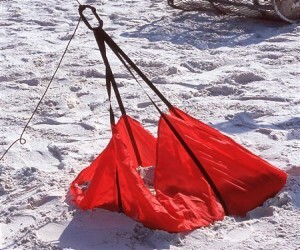 A great way to secure single line kites on the beach. A square yard of tough fabric with strong webbing attachment straps. Simple and very effective. Use in multiples for big lifters. 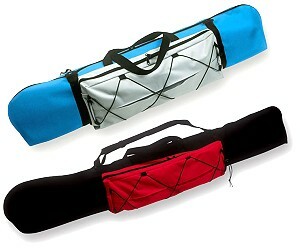 Made of durable 200D nylon, 5ft long x 30 inches wide. When filled with sand they can weigh 20 to 40-lbs. Use this kit to sleeve Spectra/Dyneema flying lines. 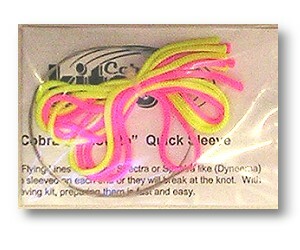 Pack contains 4 x 12" long sleeves, wire "snake" and full instructions. 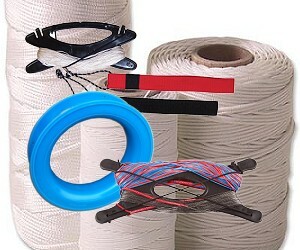 50lbs to 1,200lbs Polyester for single line kites & Dyneema® or Spectra® for steerables. 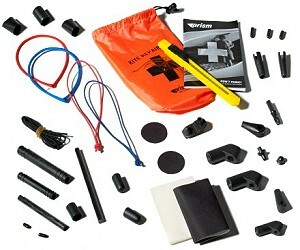 A comprehensive kite repair kit from Prism that includes spare fittings, sleeving kit, sail repair tape, knife and an excellent booklet packed with information on field repairs. A must for any 2-Line pilots gear bag.